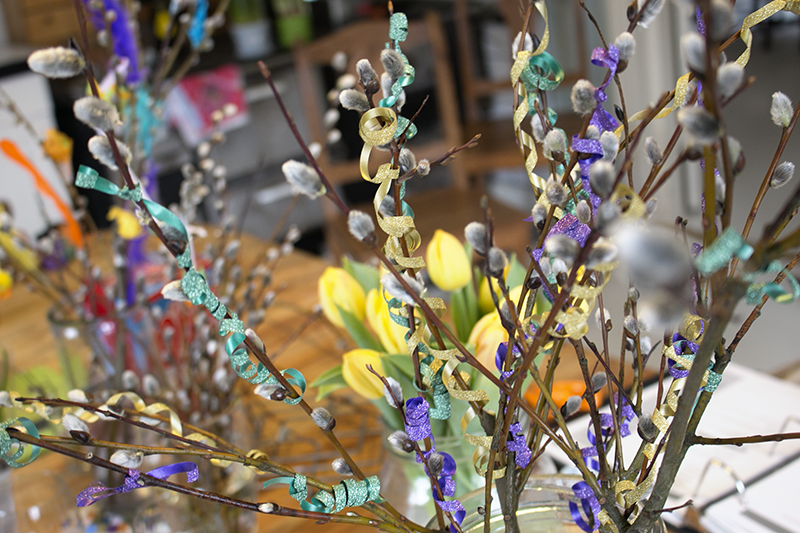 Easter is just around the corner and over here, if you have kids, it's time to decorate some branches! The branches are for when the small ones go out "witching", which can be compared a bit to trick or treat on Halloween, altough here no tricks are involved, just wishing well for the year ahead. * Tradition is to decorate the branches with feathers, but I tend to go for animal-free options, and often just a make-do of what I happen to have in the cupboards at home. I just saw a pretty funny video from one of the big supermarket chains though, saying their feathers are a certified left over product from the food (=meat) industry, which I think is good; to take as much as possible into use as long as it's there. But I'll stick to my alternatives anyway. Folder paper...thingies. With more wrapping ribbon. 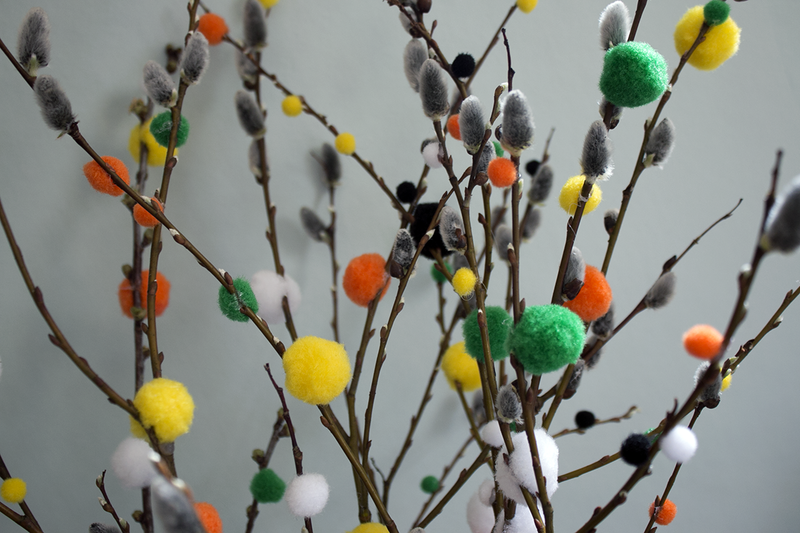 As the old wisdom goes: when in doubt, go for pom-poms. 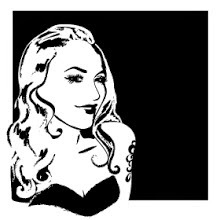 Ok perhaps that was just made up right now but pretty sure it works. I just got this idea to make bows out of chocolate bon-bon wrapping but that would mean I'd have to go trough a whole bag myself and...OK, it is so going to happen. 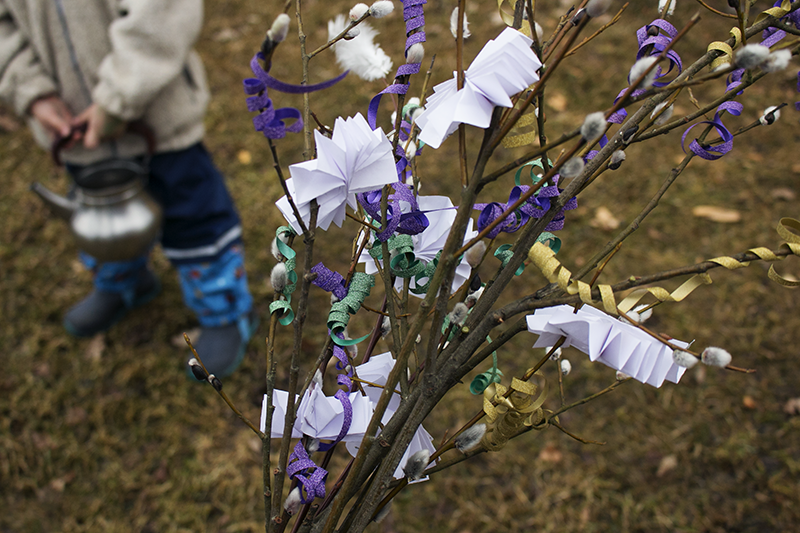 *) I've written a few sentences more on the tradition of small Easter witches, which combines both pagan and Orthodox believes, before; you can find it under my Easter-tag. 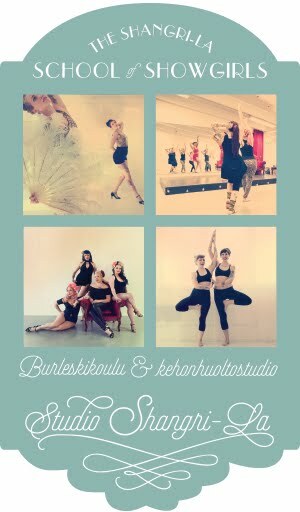 SUPPORT THE ATELIERI O.HAAPALA BOOK!